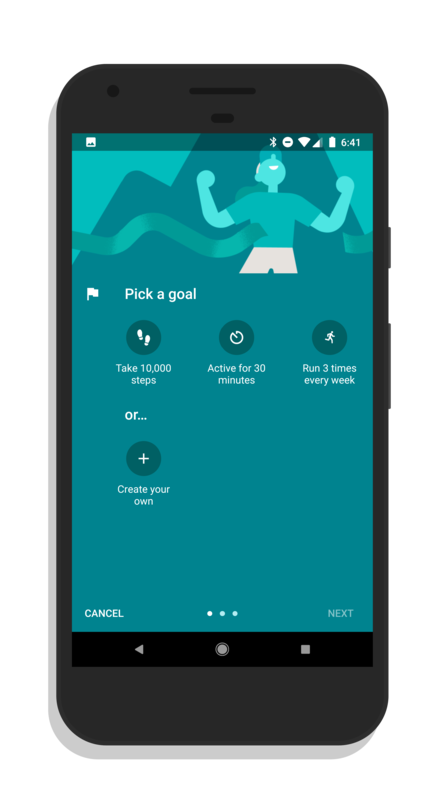 First, open up Google Fit and if you have already configured it, you should see the default 10,000 step goal already created. To create a new goal, tap the FAB (Floating Action Button) in the bottom right corner of the app and select Add Goal. From the Goal screen, you have two paths to take. First, you can tap one of the standard goals that Fit has built in and add it to your own set of goals to make the process quick and easy. Those goals include Taking 10,000 steps per day, being active for 30 minutes per day, and taking a run three times every week. If none of those goals are what you are looking to track, you can go to the second option which is to create your own goal. 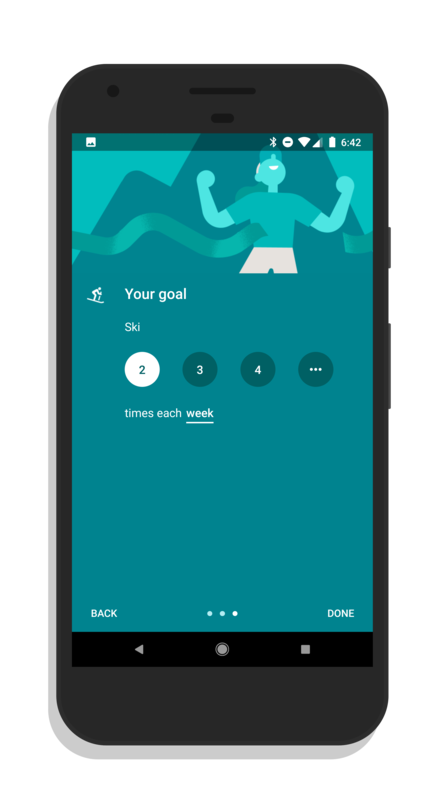 When you create your own goal in Google Fit, you are able to track virtually any activity and make it a goal. These can be steps, running or biking as the app suggests but if tap the overflow menu (the … menu) on the Choose a goal page, you can select any activity that is supported by the app as well as a calorie goal, an active time goal or a distance goal. 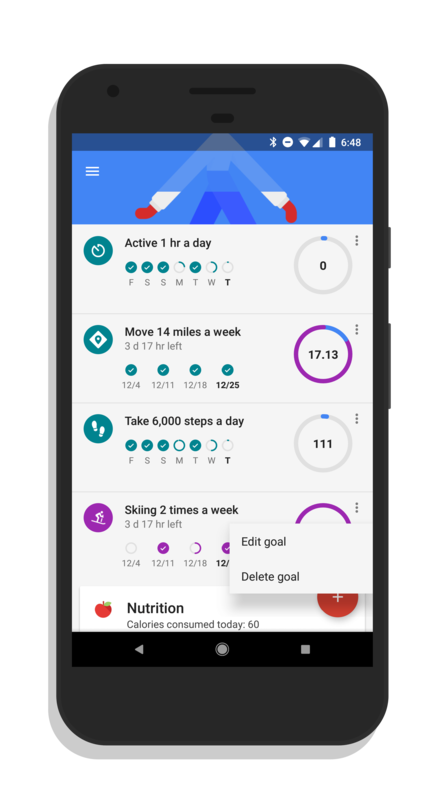 In my case, because I ski a lot in the winter, I’ve added a Ski goal to my Google Fit goals. I’ve set it up where I ski at least 2 times each week. Once you set the goal up that you want to track within Fit, tap the Done button and your goal will be added to your list of goals within the app. If you have been using the app already, it will look back at your activities for the week and if you have met the criteria for your goal, it will indicate how many times you have done that activity. 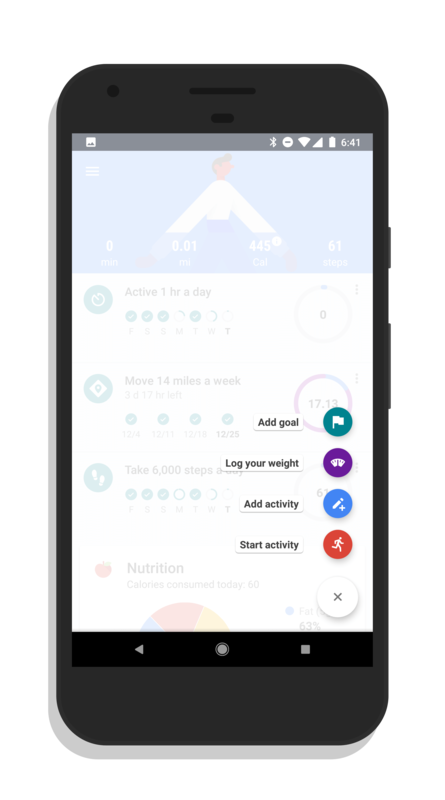 Now that you have your goals created in Google Fit, it is time to add them to your Home screen so you can see them at-a-glance. The app allows you to add multiple widgets to your Home screen and, in fact, if you have multiple goals created in the app, will ask you which one you want displayed. To do this, just tap-and-hold a blank area of your Home screen (it may vary on your device) and then select the Widgets option. 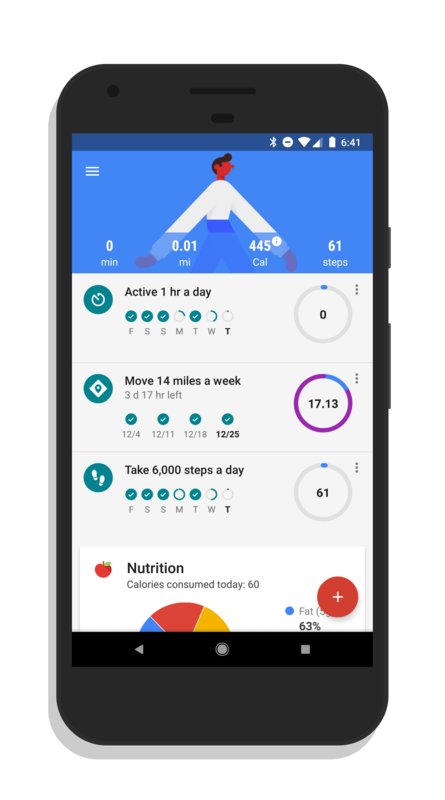 Scroll down and find Google Fit then drag it (or may just need to tap, again, based on your device) to your Home screen. You will then be prompted on which goal you want to see in the widget. Tap the goal you want to see and it will be added to your Home screen. The great thing is, you can have multiple widgets for Fit to track all your goals. Take a look at my Home screen below. I have three widgets for the app displayed to let me see my steps for the day, my active time for the day, and the miles I have been active this week. They are just below my Gmail, Google Calendar and Contacts apps. Finally, let’s say you want to get rid of a goal and its widget. That’s pretty easy too in Google Fit. Just go to the Home page inside the app and find the goal that you are wanting to delete. Use the overflow menu (the three vertical dots) and select Delete Goal. It will be removed from your goal lists in the app and the widget will automatically be removed from your Home screen if you have it setup there. Do not that only the goal is delete. No data from your activities are deleted so if you recreate the goal, the data will still be there for you. You will also note from the screenshot above that you can edit a goal at any time. For example, if I want to increase my skiing goal from 2 days a week to 4, I can edit the goal and it will take me to the setup page for the goal where i can increase the number of days. Once I tap Done, it is now my new goal and will retroactively look back at previous weeks to give me an indicator if I’ve achieved that goal. For more How To’s for Android, Chrome OS and Windows, be sure to check out the Tips & Tricks page here on the site.